After yesterday’s Vanda ampulacea we have another Sikkim lowland species today in Cymbidium aliofolium. We have seen several very large plants in the forests of Sikkim and Assam from 100m to 800m altitude. Many plants in the wild are enormous and can circle a large tree with their long lived, tough, thick leaves and extensive root systems. 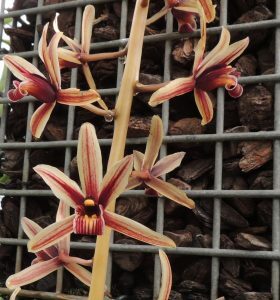 The species is common in its habitat and is not threatened by the horticultural trade as the plants are very large for the size of the flowers and the pendulous habit makes it ideal for a forest but poorly suited to a pot. We grow our plants in large baskets which show the thick leathery leaves and long spikes of attractive flowers off to their best. Plants produce their long pendulous flower spikes over a couple of months. Plants enjoy conditions hanging in the roof of Warm Asia – warm and bright like their forest home.